When purchasing a dining set, don’t be afraid to purchase the chairs and table separately! 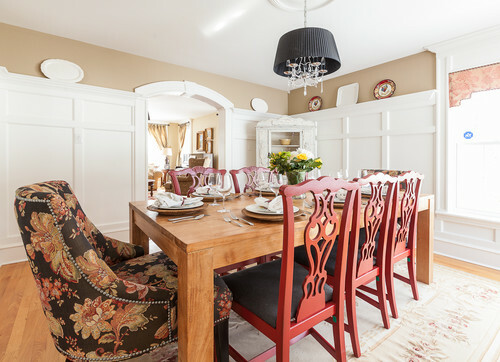 In the last picture: check out the chunky, clean lines of the dining table – paired with curved, dainty chairs! 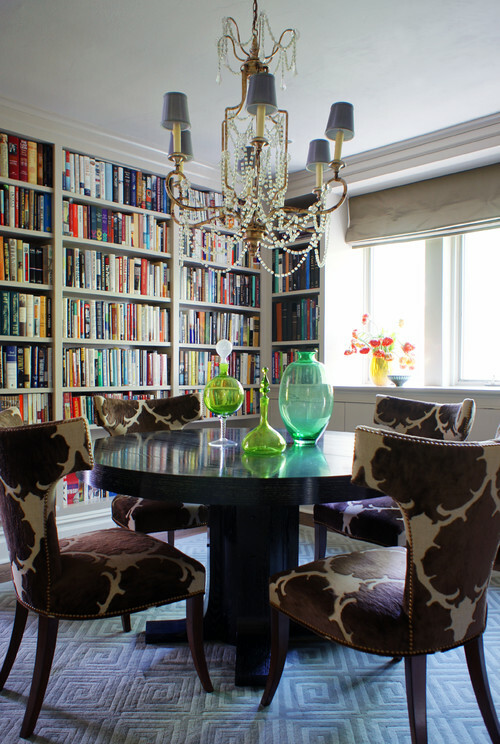 It creates such a fresh, yet traditional look – so don’t fear, start pairing chairs and tables in interesting ways! These Bertoia Chairs are sure to make a statement! Have other bold, colorful, or busy elements in the room? These chairs are perfect! They are sleek, unique, and chic: and the wire mesh creates a view through the chair that keeps them feeling light and airy! Can you say showstopper! These Eames Chairs are available in several different colors. Love those legs. Ready to take it to the next level with a pattern? Target has a grand selection of patterned chairs. I am a sucker for these Floral Patterned ones! Copper: all the rage. Love these Metal Chairs! I’ve shared the Paige Dining Chairs from World Market before. I guess you could say I’m obsessed. This fuschia beauty will definitely steal the show! Ah, the Zinfandel Lydia Chairs. So rich. So luscious. Red wine in a red wine chair please! And… you guys know my affinity towards auctions & thrifting. Just for kicks I thought I would check out Craigslist. And… here’s what I found! [source] Look at these modern beauties! At $400 for the table and all 4 chairs, I would say worth every penny! I would just make sure there aren’t any nasty scratches, then load it up to bring it home! Paint the walls a dark, rich color & these white chairs will really pop. [source] Okay, when a beauty like this comes along – buy the chairs & table together, please! Oh boy – I’m already eating my words. But really, this set is gorgeous! At $1400 for the set – if you have the room, totally worth it! Reupholstering those seats will be a breeze. [source] Hello beautiful shield back chairs! You shall protect my dining room from looking drab! [source] These chairs are screaming for some color or a bold pattern. Oops, it says they were just recovered. Eh, once they’re yours, free reign! [source] I’ll admit, I’m extremely on the fence about these four. Could they be fabulous? Are they just too far gone? Welp, for $50 – it might be worth a try? What would you do with these chairs? I’m thinking a glossy white paint job & a solid, bold color upholstery. Thanks for coming along on this dining chair adventure. That was fun, let’s do it again sometime. So, do tell – do you like to go bold with dining chairs? Hey there. I am a small town, Nebraska girl passionate about creativity, color, and most of all: helping people bring their homes to life in ways they never thought possible. I want my career to be about spaces that work well for those who inhabit them. Spaces that don’t just sit pretty, but inspire us to practice hospitality, to create memories, or to simply retreat and relax. I have found a new love for writing, and enjoy sharing thoughts, inspirations, and designs on my blog. Thanks for reading. That second inspiration picture has been in my files for awhile. Love the whole look. I’m in the process of going bold with my dining chairs and I can’t wait to update the very traditional lines with a punchy pattern!